For the first time Canadian artists Ron and Damian Moppett (father and son) are exhibiting selections from their vast collection of work together at the Art Gallery of Alberta. 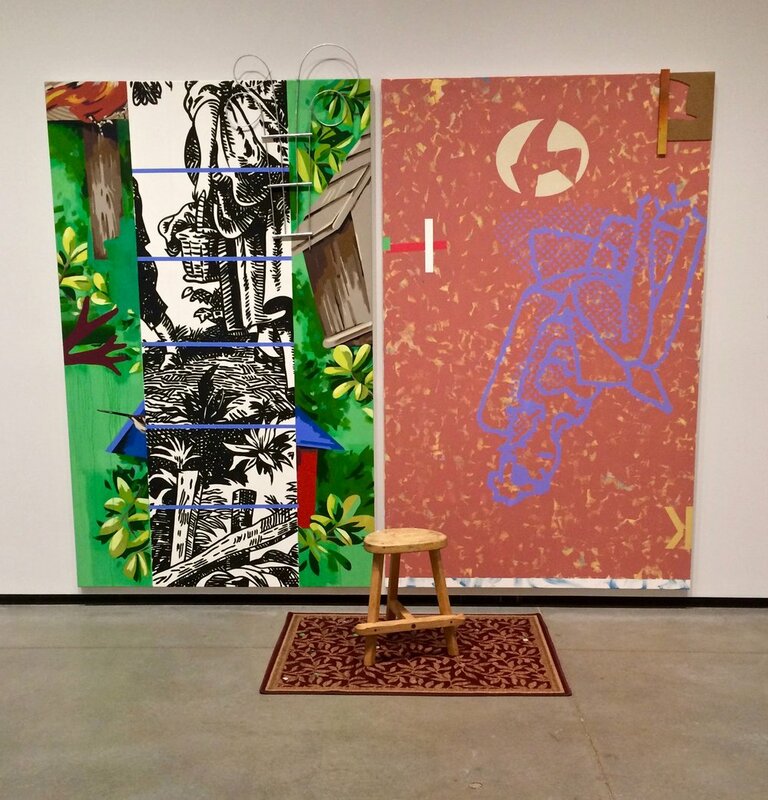 This unique show explores the similarity in their artistic practices and the different approaches that they use to interpret the subject of the artists's studio. Both are studio artists which, according to Ron, means that their job is to go to the studio every day and paint (or create). Both men are devoted to their craft. According to the artists, this grouping was their favourite of the exhibition. The selected works for the exhibit Damian Moppett + Ron Moppett (Every Story Has Two Sides) are pulled from no specific time period, but were chosen by how they work together when displayed side by side. You will see pieces by Ron stretching back to the 70s and Damian's oldest pieces are from the 90s. Ron was born in England in 1945, moved to Canada in 1957, and has had an incredible career to date which has involved solo and group exhibitions around the world. His paintings blur realism with abstraction and he uses stencilling, cut outs and layering to create his stunning, large scale works. Damian was born in Calgary, Alberta, Canada in 1969 and works in all forms of media, including photography, sculpture, painting, video, and drawing. His pieces explore the idea of what art is and the process of making it. The artist studio, and the materials within it are represented in most of his pieces as works of art themselves.